Justin Bieber really got an addiction; fortunately, it’s not the illegal type. The “Believe” singer has grown a passion for tattoos and has been getting numerous tattoos in the last year. Again, he has added another tattoo to his large collection and this time it’s a little fishy. Yes, Bieber’s fishy tattoo is a beautiful koi fish ink on his left arm, below his wise owl and “X” or Christ tattoo. Reports show that Beibs got his new tattoo while he was in Copenhagen, Denmark for a concert. 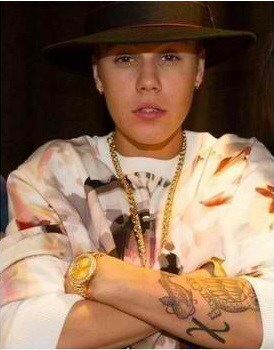 Also, a photo of Bieb’s new tattoo when vital in twitter, showing off his koi fish tattoo with his arms crossed. The “Baby” singer never mentioned the meaning of his mysterious owl tattoo perched on a key. But generally, an owl holding a key can symbolize the key to knowledge, since owls represent wisdom. But the big question is, why did he chose to ink the koi fish below the owl? Clear some owls eat fish. On the other hand, a koi fish symbolizes good fortune and good luck, but due to where the tattoo is inked, the koi fish may also represent a person successfully getting though hardship. Could this symbolize the difficult times Justin had with his recently reunited love Selena Gomez? Or maybe he got the koi fish to represent how lucky he feels since he got her back in his life. He may be lucky, but it seems the young star is trying hard to prove reports that the rumors of him and Selena being back together are true. On Saturday night, Justin posted and instagram photo of himself and Selena together. But surprisingly, Biebs quickly deleted the image a few minutes after it was posted. Why did Biebs deleted the image? Was it because of Selena? What do you think?